Quesadillas are one of my go-to meals whenever I’m feeling too tired to cook (which seems to be happening a lot of the time at the moment!). They are SUPER simple to make and are a great way to use up food I already have in the fridge (including leftovers) and most importantly, my entire family eats them. 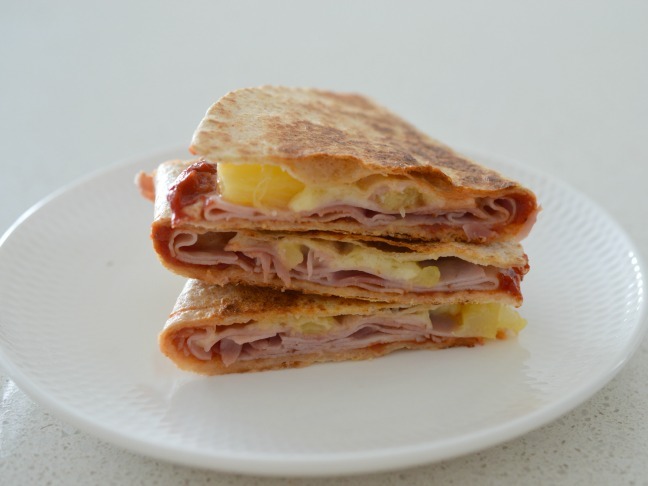 As well as being an easy dinner or lunch option at home, quesadillas are also a good sandwich alternative for the kids lunch boxes. My five-year-old loves chicken, cheese and BBQ sauce quesadillas in her lunch box. 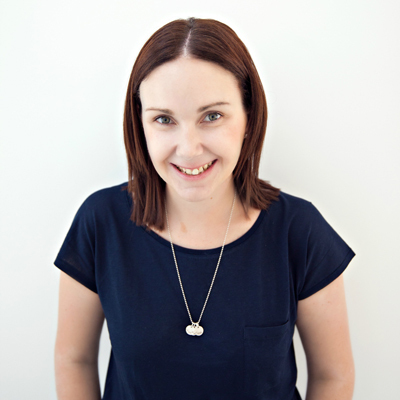 I’ve even frozen cooked quesadillas before for an easy lunch option on my busy days. Because they are so easy and versatile, I sit down to a quesadilla for lunch at least twice a week – yes I am a little obsessed. Luckily for me, my family is also on board with my quesadilla obsession. 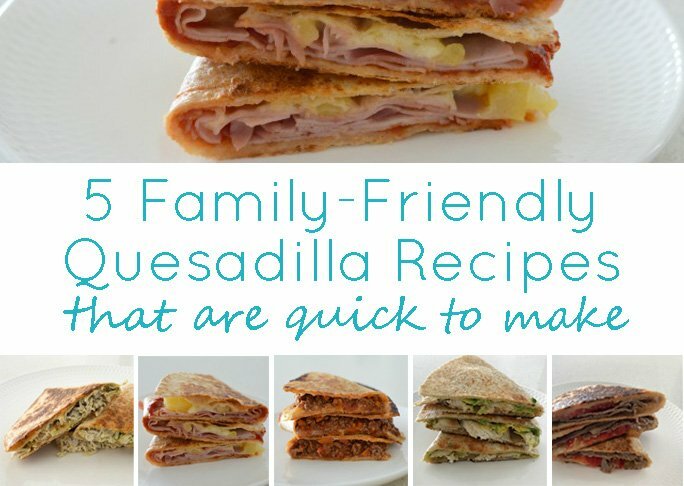 Today I’m sharing our favourite family-friendly quesadilla recipes that are all simple to make and loved by us all. These Pizza Quesadillas are always super popular with my kids. 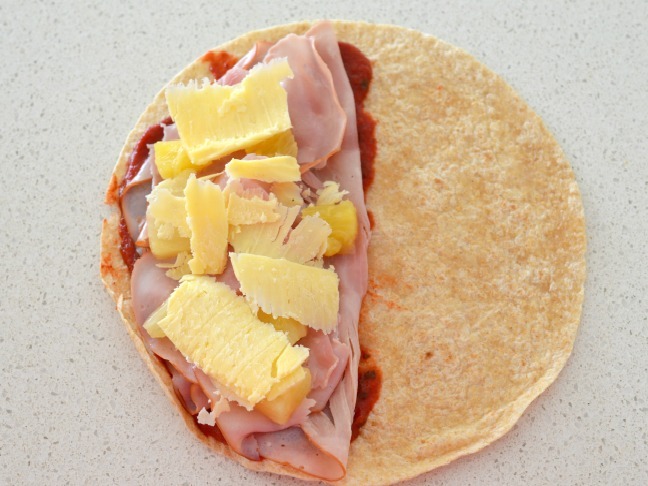 Simply cover half a tortilla with pizza sauce, add 50g of shaved ham, 1/4 cup of pineapple pieces, 25g of mozzarella cheese plus another 25 grams of tasty cheese. This combination is my current favourite lunch recipe. To make this simple lunch, all you need to do is cover half of your tortilla with 2 tablespoons of basil pesto, sprinkle 100g of shredded chicken over the top, add half an avocado and sprinkle over 50g of crumbed feta. 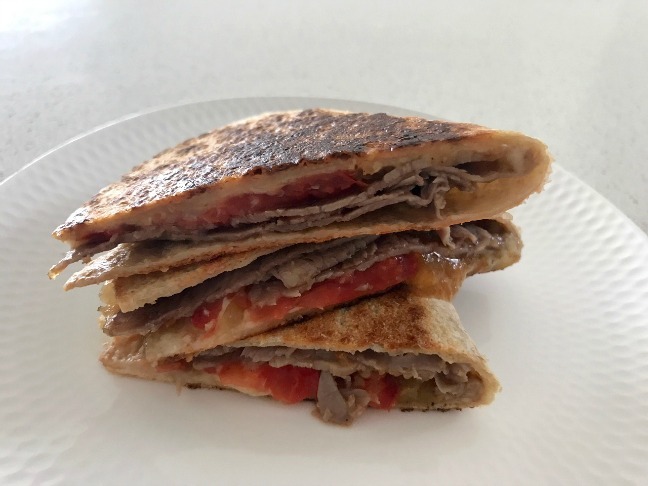 For an easy meal on the run (and great for lunch boxes too), you really need to try these Roast Beef and Tomato Relish Quesadillas. All you need to do is spread two tablespoons of tomato relish over half of a tortilla, add 75g of roast beef and sprinkle with 50g of grated mozzarella cheese – too easy! These ‘Leftovers’ Quesadillas are the PERFECT weekend meal and are a great way to use up any leftovers from the week. 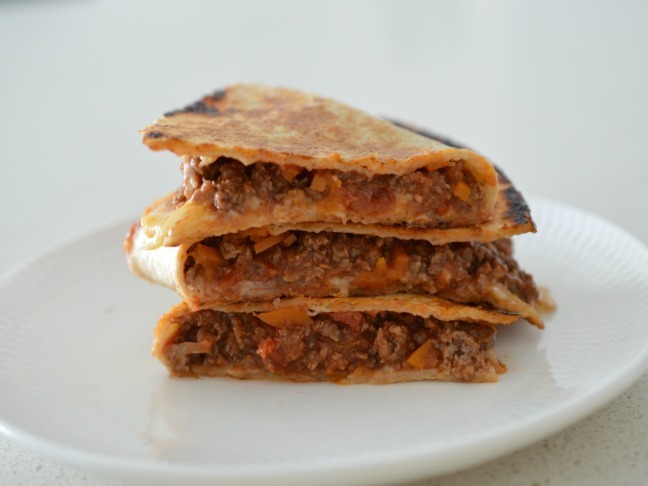 You can add pretty much anything to these quesadillas but one of our favourite fillings (and I often make sure I’ve got leftovers just so I can make these) are 1/3 cup of bolognese spread over half a tortilla and topped with 1/4 cup of grated tasty cheese – yum! You can also use leftover chilli con carne and we’ve even had these with homemade fried rice too! 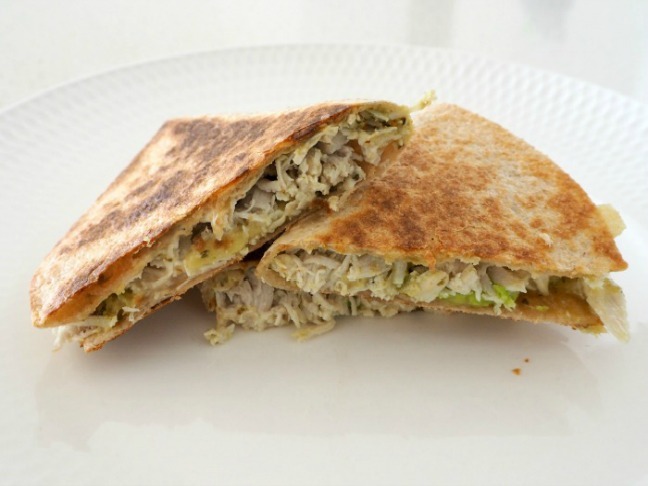 It only made sense to add one of my favourite sandwich fillings into a quesadilla! 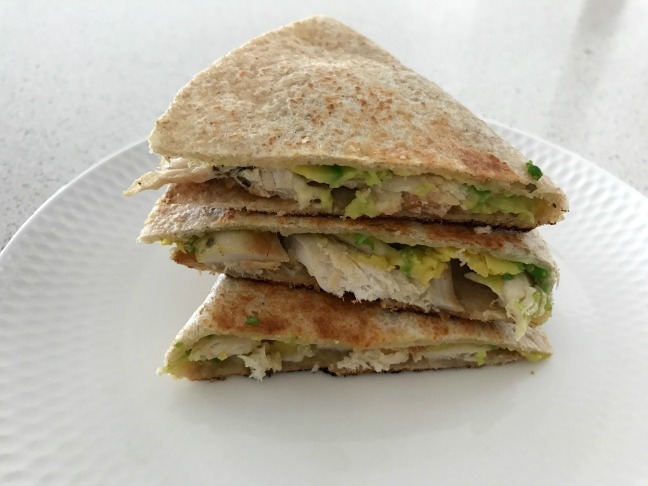 To make this Chicken, Avocado and Cheese Quesadilla all you need to do is spread approximately 1/2 an avocado over the top of half of your tortilla and then add 100g of cooked chicken and 50g of grated mozzarella cheese. Step 1: Add a little olive oil to a frying pan and place over a medium heat. Step 2: Place one tortilla on your bench and cover half of it with your quesadilla ingredients (see plenty of options above). 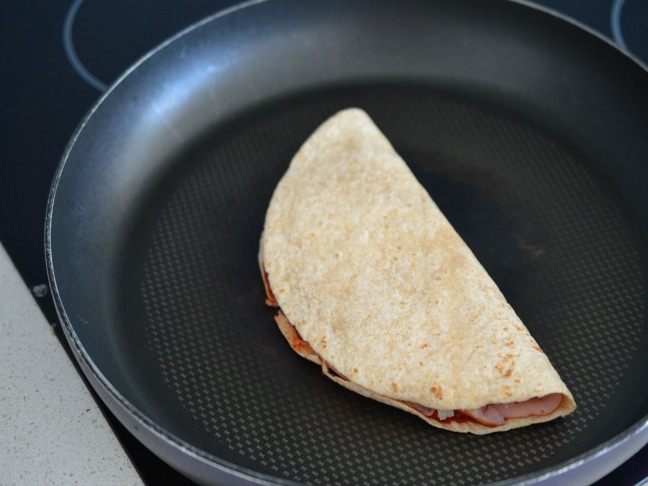 Step 3: Fold the tortilla in half and place into your heated pan and cook for for 3 minutes or until the tortilla begins to brown. Carefully flip over and cook for another 3 - 4 minutes or until the cheese has melted and the tortilla has browned. Step 4: Cut into triangles and serve immediately. You're done!